I remember reading Sassy magazine in the late 80s and early 90s and clipping out beauty articles. Even at a early age I was into skin care and cosmetics, my sister and I would try out the homemade products I would make in the kitchen. Years later I still search through magazines for ideas and make some of my own cosmetics. I try to get my boyfriend Matt to try them but he is not to happy with me slathering things on his face! I have really sensitive skin that tends to be oily. Currently these products are in heavy rotation in my cabinet. 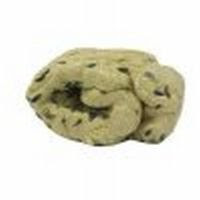 Angels on Bare Skin by Lush: When I was in a Lush store and this product was recommended to me I was hesitant because it contains lavender oil and lavender tends make me itchy in large doses. After one use I was hooked, my skin felt clean and soft with no itchy mess at all. I use it almost daily. Ubtan Face Scrub by Skin Apothke: Yup - another face scrub. This smells like incense, rich with sandalwood and spices and it contains lentils - which is a favorite food of mine! It is gentle and leaves skin glowing. I use it mixed with water but need to try and use it mixed with soy milk! 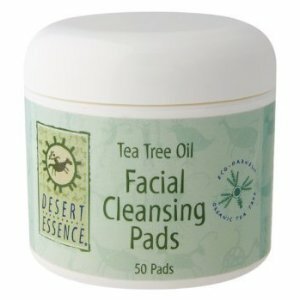 Tea Tree Oil Facial Cleansing Pads by Desert Essence: These are awesome for after washing your face at night and getting rid of any lingering makeup and oil. These keep my face spot free and do not dry my skin out at all. 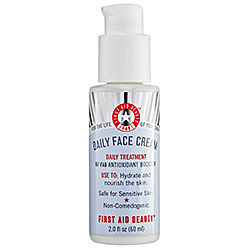 Daily Face Cream by First Aid Beauty: This leaves my skin moisturized at night without it leaving it oily or filmy. 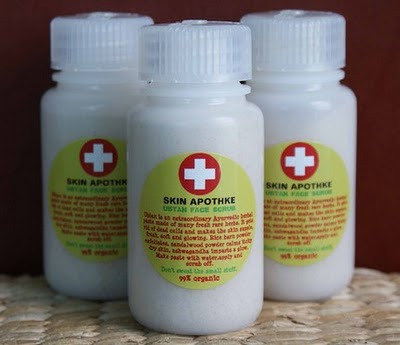 It is really gentle and soothing to use after using a tea tree oil pad or toner. Stay tuned for some of my tried and true skin care recipes coming soon, till then remember show your skin some love! I will definitely look for these products, as I have almost daily exposure to pollution and sun which is harming my skin alot these days.